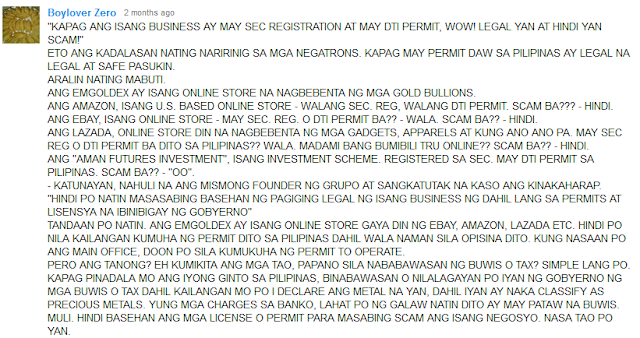 Home » EMGOLDEX » Global InterGold » Gold » Gold Trading » Networking » Pyramiding » Scam » What is EMGOLDEX? a Scam? Networking? Investment? According to the EmGoldex website: EMGOLDEX specializes in the buying and selling of investment gold bars of different value. 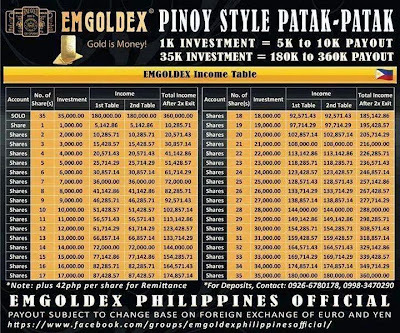 The emgoldex investment gold is procured and provided only by the top producers internationally. In short, EmGoldex is involved with “buying and selling investment gold bars”. UPDATE: EMGOLDEX has now changed name to GLOBAL InterGold. 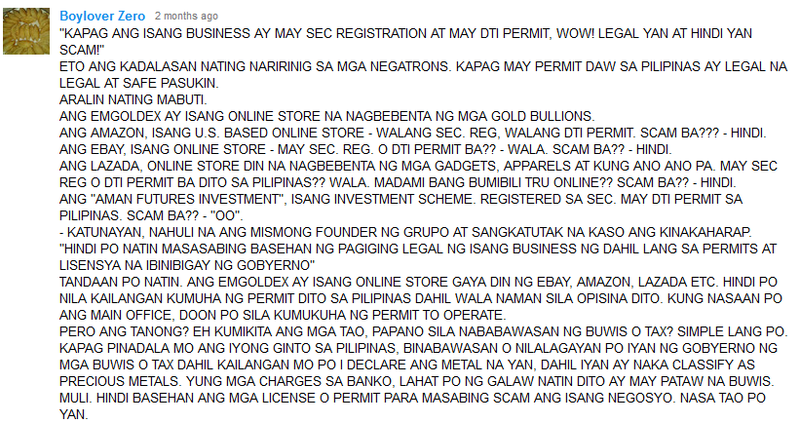 But recently, the Securities and Exchange Commission (SEC) warns the public about an Online investment scheme. 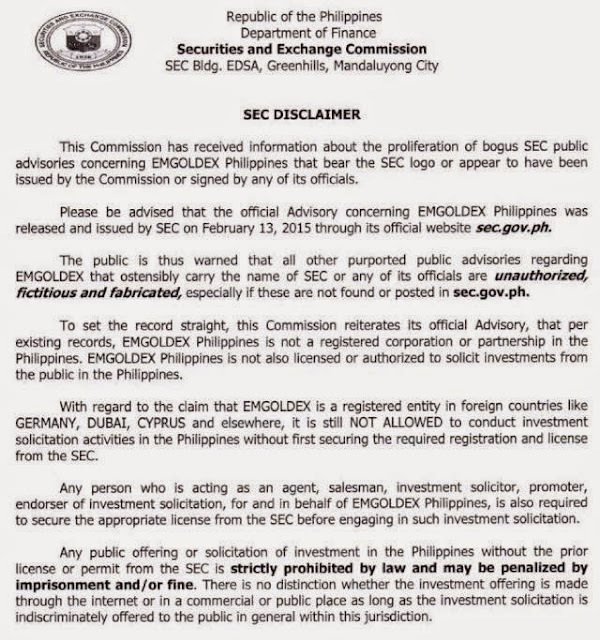 The SEC said Emgoldex Philipines is using the power of social media to discuss and convince people to invest their hard-earned money as being promised for double or triple of investment returns. They allegedly declare/guarantee that an investment of Php1,000.00 would earn profits ranging from Php5,000.00 to Php10,000.00 or a placement of Php35,000.00 would yield Php180,000.00 to Php360,000.00. I tried to be "Open Minded" and just from what I researched, heard and learned I can't quite grasp how to double the money based from how the price changes of precious metals work against there "system." 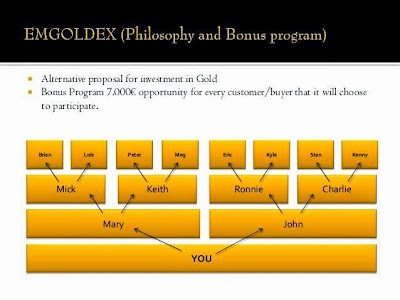 I'm not even sure if it is a Multi-Level Marketing firm since MLMs usually have a product that can be directly sold (retail, load, financial products or the like), here on the other hand the investor isn't given get there hands on gold to sell? In their facebook page or there recruiter-investor, they say that there is no-recruiting-requirements, no-selling-of-products, but with 500% ROI.. WHUT? 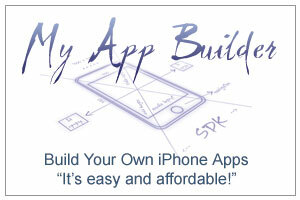 Which company do you know offers NO products and NO services, but still manages to earn income? In order for any company to earn, there needs to be a business transaction, an exchange of goods and services of value. So no selling of products but you get paid? Have they found a way to make money rain from the sky? "Your goal is to recruit 14 people under you, so you can earn." A simple question follows: How does that relate to gold investing? The company has a marketing program that you can enroll in that allows you to order the gold bars, and then make money (eventually) by getting two other people to enroll in the program as well. So if you think about it, in order to pay out 1 person, the company needs 15 more people to join. So in order to pay out all 16 of them, they would need 256 more people (16x16). In order to pay out those people, they would need 4,096 more people (256x16). The more people who join, the more people they will need in order to pay out everyone who joined before them. Is that realistic and achievable? NO. Country Registration: As per SEC PH, not registered. No clear leading figures. Who heads this organization? Even sari-sari stores are registered under DTI. The purpose for this is of course monitoring, tax obligations, regulation and to protect the public. It's like drugs, there are regulated (by the government, BFAD or the like agency) drugs that are sold in the Pharmacies and there are illegal drugs. There are no guarantees, whether it is stocks, mutual funds, UITFs, Real Estate, Franchising, Businesses and the like. There is always risk and return trade offs. If low risk, then the returns are low; if High then High returns! Using http://www.goldpriceoz.com/ historical Gold Price, we can make a realistic computation. Now let's say I bought 1 ounce of gold for USD513.00 way back and 2005 and I want to sell them today's price of USD1,188.00! I made USD675.00, that is roughly 130% or so in 11 years (6 month growth will be around at least 15%). 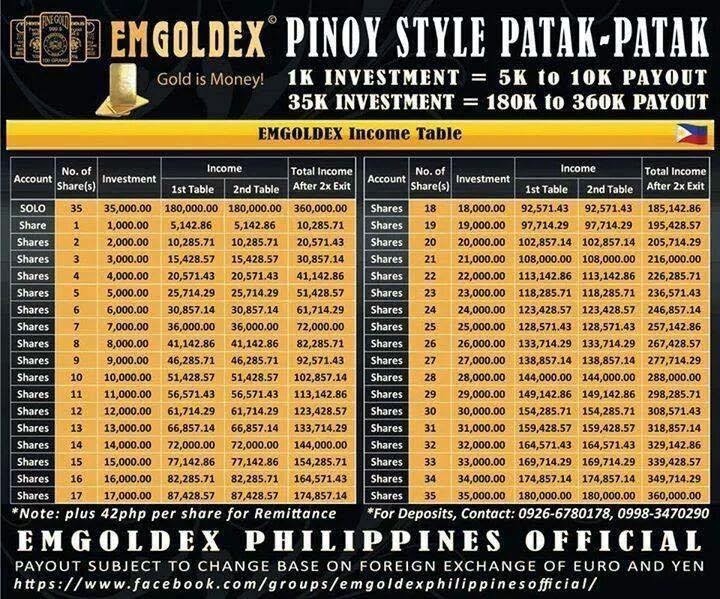 In contrast, Global InterGold or EmGoldex promises to turn your Php35,000 into Php180,000 in less than a year. That's a whopping 514% return on investment. How did they earn that much money in such a short time? By buying and selling gold? But we have already shown that's not possible. You can find the proof of payouts in their facebook page/account. The SEC is doing their best to bring awareness to the public about this high-risk investment scheme. Upon verification, the SEC confirmed that Emgoldex Philippines is not a registered corporation or partnership. At the end of the day, you still decide. It's your money, your future, your decision. I believe a lot of the distributors doing this sincerely believe that it is a legitimate enterprise and that they are helping other people in the process. Who are the scammers then? I say it is the allegedly damn institution that are scammers and they have fooled all these people who have joined them. Do you want to know how to earn money from precious metals? Check out NatGeo's Money Meltdown Webisodes!